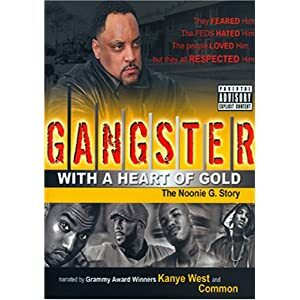 Once a member of the Gangster Disciples, Noonie G alters his entire lifestyle and is now one of Chicago’s most elite entrepreneurs and philanthropists. Needless to say, he wasn’t one to turn his back on his own people, his native Altgeld Gardens Projects in Chicago. Indeed, Noonie G was indebted to the community that raised him and made him a man. On a grander scale, Noonie was responsible for organizing the 1992 Gang Summit that vied to unite all the gangs throughout the nation and bring peace. Additionally, Noonie, a man who was always familiar with and understood the tensions between rival gangs, is now requested by neighborhood police officers to act as mediator in stressful situations. The impact and transformation in Noonie is truly moving. Worthy of note regarding his contributions is the fact that he brings with him an entourage of celebrities that see what is being accomplished, and as a result, offer to join his activist movement to create change. Gangster with a Heart of Gold is truly a remarkable story that needs telling. Read it to your kids, parents, and friends. Noonie is a man of redemption and a man of change, a model for all to follow. The day that Noonie G’s dream is a part of every hood will be the day when sweeping changes will be made throughout the United States—and the world will be a better place as a result. My Take on the BookThis was a quick but important story for anyone that has been or is being touched by gangs or gang violence. This book is truly a story of redemption and tells everyone that it is never too late to make amends and move away form you past. Noonie shows that even though he did bad things in the past that he could change himself and his ways to make more of a positive life for himself and a better life for the people in the world around him. The book does have a slight spiritual tone, and you can tell that is was through his beliefs that he was able to pull himself out of the destructive cycle that he was in. On to of Noonie sharing his own experiences, I found this book to be one that any parent could use to be inspired to take active roles in their own children's lives. Noonie stresses the importance of parents being good role models and for being involved in their kids lives. Though the situations in this book were vastly different than any that I even knew in my own upbrining, it was still a great, quick read that will leave you inspired to do better!